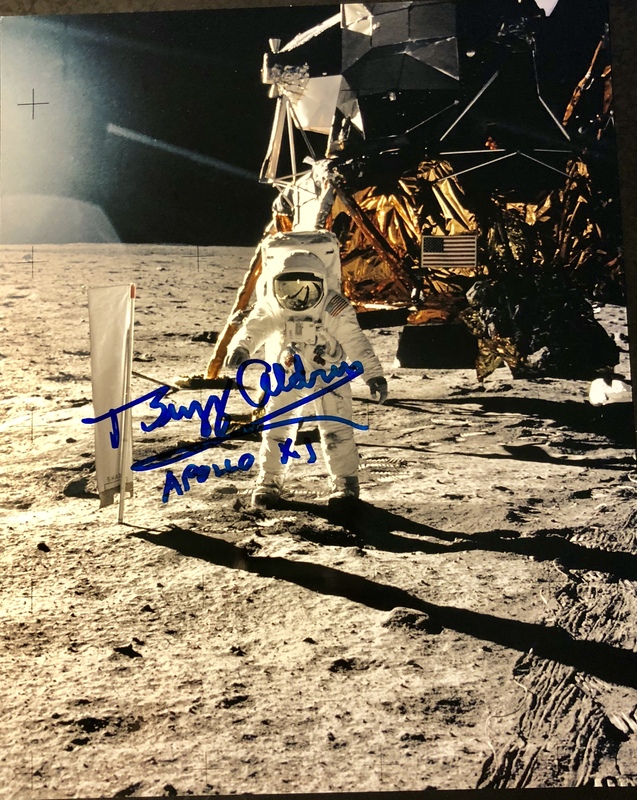 This stunning 8 x 10″ photo of Buzz Aldrin on the moon conducting a science experiment is authentically signed by Aldrin and is accompanied by a certificate of authenticity. 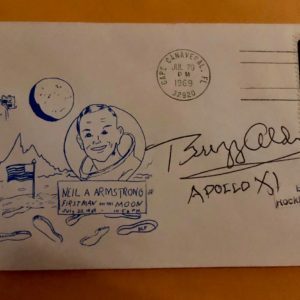 Smithsonian writes about this image: NASA didn’t send people to the moon just to bounce around and hit golf balls; Neil Armstrong and Buzz Aldrin of Apollo 11 were performing science experiments during their brief time on the lunar surface. What looks like a white towel next to Aldrin in the photo above was the Solar Wind Composition Experiment. The Lunar Module “Eagle” sits behind Aldrin in this historic shot! More about the Experiment: The Sun continually emits a flux of electrically charged particles into space. This is termed the solar wind. The Earth’s magnetic field prevents these charged particles from reaching the Earth’s surface, although in the Earth’s polar regions, these particles can reach the upper part of the atmosphere, causing auroras. The Moon is outside the Earth’s magnetic field for most of each month and has a negligible atmosphere, allowing solar-wind particles to reach the Moon’s surface…. 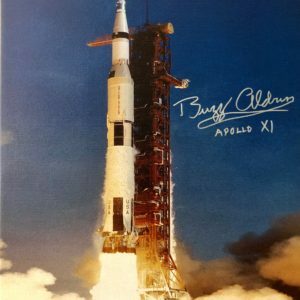 The Solar Wind Composition Experiment was performed on Apollo 11, 12, 14, 15, and 16. It consisted of an aluminum foil sheet, 1.4 meters by 0.3 meters, that was deployed on a pole facing the sun. 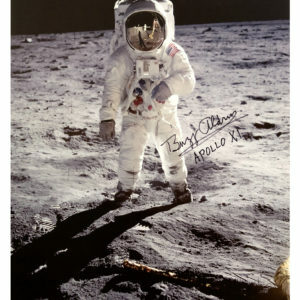 On Apollo 16, a platinum sheet was also used. This foil was exposed to the sun for periods ranging from 77 minutes on Apollo 11 to 45 hours on Apollo 16, allowing solar-wind particles to embed themselves into the foil. The foil was then returned to Earth for laboratory analysis. This allowed the chemical composition of the embedded solar wind to be determined more accurately than would be possible if the measurement were made using remotely controlled instruments on the Moon, but limited the periods at which observations could be made. The isotopes of the light noble gases were measured, including helium-3, helium-4, neon-20, neon-21, neon-22, and argon-36. Some variation in the composition of the solar wind was observed in the measurements from the different mission. These variations were correlated with variations in the intensity of the solar wind as determined from magnetic field measurements.